Home > Blog > What is hydro jetting? Hydro jetting is a method used by professional plumbing contractors to clean clogged or slow sewage lines. A blast of water at high pressure is sent into the lines that will usually remove blockages and build up. Hydro jetting systems normally use about 35,000 psi, which works very effectively. A video inspection should be performed first to determine the cause and location of the problem. If tree roots are a problem, the high pressure should cut through them. However, a snake may need to be used first to tear up heavy roots. Hydro jetting will not solve problems with broken pipes and could cause weakened areas to break. In addition, a video inspection can reduce the possibility of sewage back flushing into other areas. 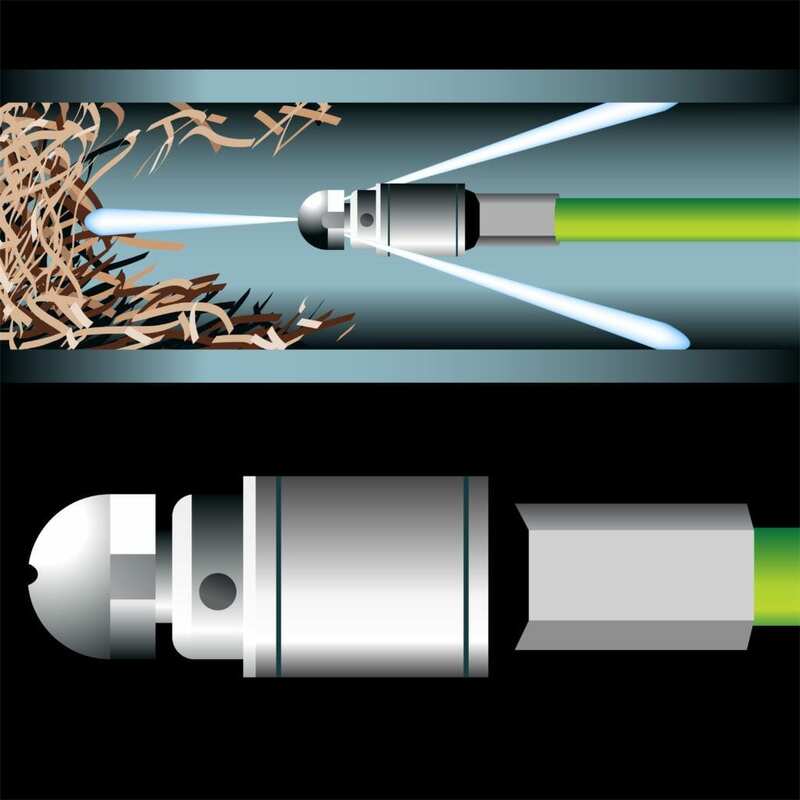 A nozzle is fed into your drain or into the pipe, and it is usually self-propelled through the pipe from the pressure, up to 35,000psi or more. Nozzle may differ depending on the application, drain size or type of clogged material. As the nozzle encounters a clog, be it a unsolved food, thick grease or any type of fabric, a high-pressure jets streams exert such a powerful tear on the material, that it starts to dissolve. What can be removed with hydro jetting? For residential work, hydro jetting can remove sand, silt and scale build up as well as hair clogs and other residues that build up on the walls of the pipes. Routine hydro jetting should be done on restaurants to remove grease and food particle build up. This type of service can completely clean pipes of residual build up in ways that snaking can not. Hydro jetting should be done by a professional plumbing contractor. The high pressure could damage lines if they are not properly inspected first. Quality plumbers are trained in the use of the system and know what to look for to prevent damage and thoroughly clean the entire system. While hydro jetting is frequently used in commercial plumbing, it can be extremely beneficial to homeowners. If you need to have your plumbing snaked on a regular basis a hydro jetting service will eliminate all the debris in the lines. The service can greatly improve older plumbing lines that have years of build up. It is also particularly useful for homeowners that experience sand and silt build up as chemical cleaners and augers will not flush the system completely.